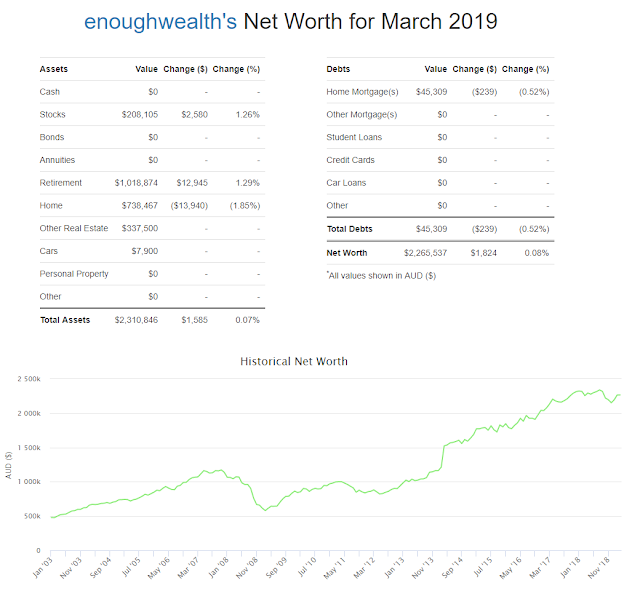 The continued rebound in local and international share markets meant that my retirement savings balance increased $43,045 (4.47%) and my geared share portfolio increased $29,660. 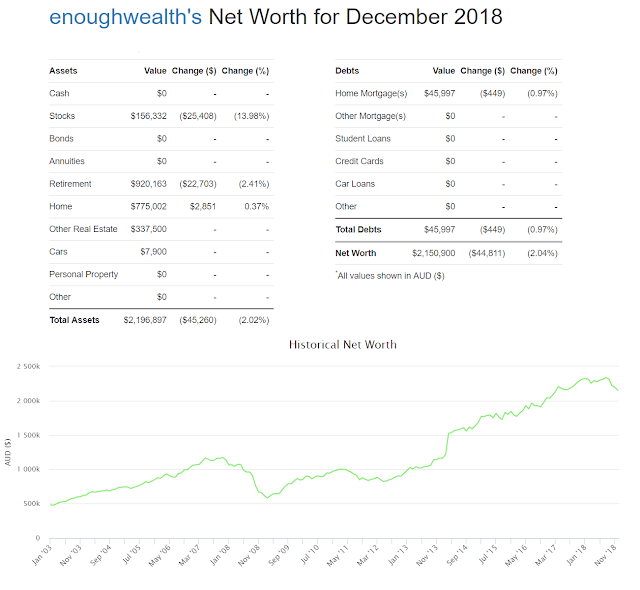 The continued deflation of the property bubble nationwide, and especially Sydney, meant that the gain in my share portfolio was somewhat offset by the valuation of our home decreasing by $4,198 (0.55%) during the month. The rate of decline in house prices appears to be moderating slightly, suggesting a normal house price cyclical decline rather than a 'crash' or deflation of a 'bubble'. 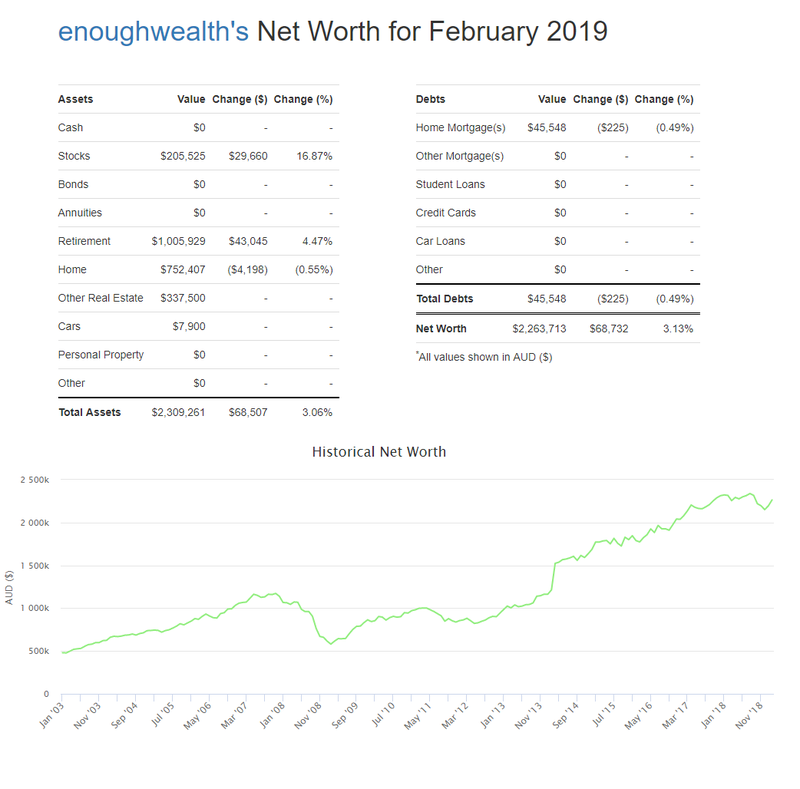 Overall, my net worth recovered $68,732 (3.13%) during the month to $2,263,713. Still below my all time peak. Funding my university studies and running costs of my start-up financial planning business continue to cost around $2,500 per month. I received my annual bonus last month (approx. $9K after tax), which will help with cash flow for a while. I setup a free business entry in the 'yellow pages' yesterday and was immediately called by a couple of charity fund-raisers this morning seeking sponsorship/advertising support this morning. I agreed to sponsor the local Neighbourhood Watch (via a $440 ad in the local youth support magazine they produce annually) but I will have to decline supporting any other local groups (at least until I have my first paying client!) I'm still working on the website for my business, but should get that up and running by the end of March. 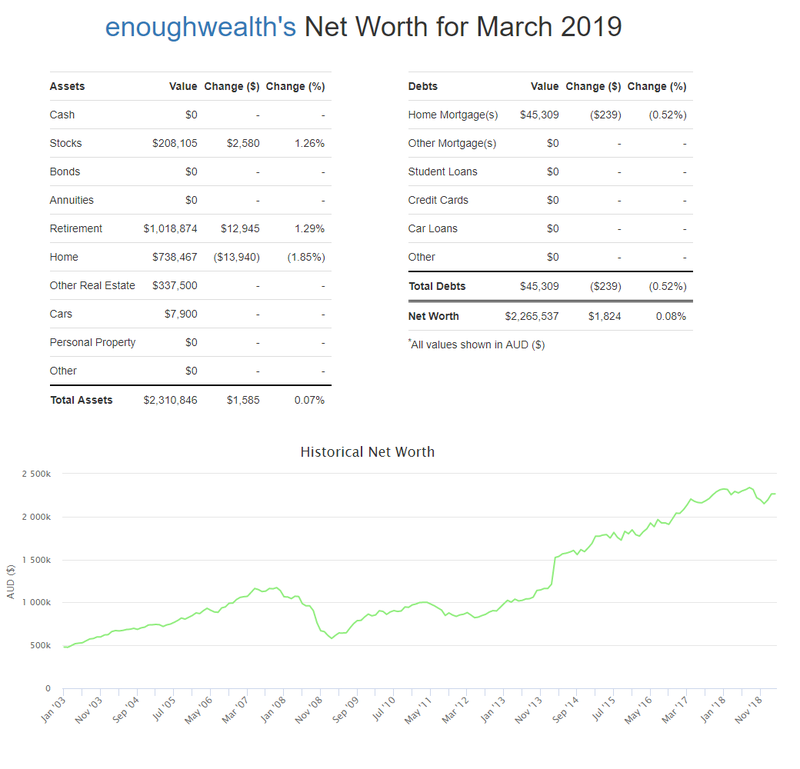 A rebound in local and international share markets meant that my retirement savings balance increased $42,724 (4.64%) and my geared share portfolio increased $19,533. The continued deflation of the property bubble nationwide, and especially Sydney, meant that the gain in my share portfolio was more or less offset by the valuation of our home decreasing by $18,397 (2.37%) during the month. 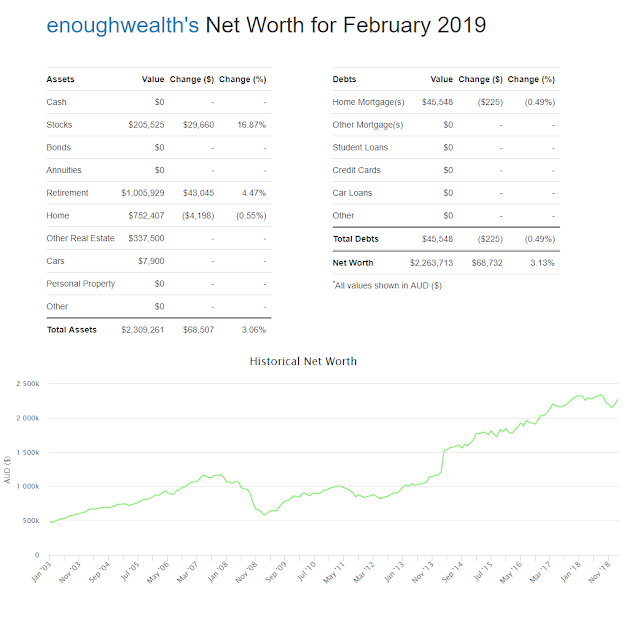 Overall, my net worth recovered $44,081 (2.05%) during the month to $2,194,981. Still well below my all time peak. I've started using some of the credit available in my St George 'portfolio loan' facility to fund my financial planning expenses (the self-education costs of the Masters degree, and the monthly licencee fee and CRM/admin package fee for the basic module of 'Midwinter'). Until I start receiving some client fee income, this debt will accrue at a rate of about $2,430 per month. Using the one loan facility to fund the major business running costs and self-education costs will make it easy to keep track of the amount of (tax deductible) interest I pay. My goal is to start generating business income during 2019, and to generate enough business income during 2020 to cover running costs ('break even'). Hopefully by 2021 the business will be profitable, or at least cover the running costs and related self-education costs (the Masters, then possible a MRes degree followed by a PhD in Financial Planning). We'll see how things pan out. I received an unusual offer via email the other day - I could receive 20,000 Qantas Frequent Flyer points if I opened a superannuation account online with AustralianSuper using the provided link, and contributed $350 within six months. Anyhow, I decided to take up the offer. It took about 5 minutes to complete the online application process, and the BPay details for making a contribution were available the following day when I logged in to my new account. I did a BPay of the $350 personal contribution the day after I opened the account, and the funds were reflected in my balance the next day (I invested 50% in Australian Shares and 50% in International Shares) - which had gone up to $351.25. I'll wait an see when the promised QFF points get credited, and then do a rollover application. All in all, a fairly quick and painless way to 'earn' an extra 20,000 QFF points. As I'm trying to launch my business on a low-cost, DIY basis I registered my business domain name using Dotster but then want to host the website content using my existing personal hosting account with GoDaddy. So I had to set up a 'redirect' of the URL from the name servers at Dotster to the hosting at GoDaddy. Took a bit of fiddling around but it seems to be working OK. The next step was to install Wordpress for that domain in GoDaddy, and install a suitable 'Theme' (free of course). I eventually picked 'Sydney' after dabbling with 'Tesseract' but not being able to get it to work properly. I had a bit of trouble getting the recommended plugins (Elementor and Sydney Tools) working until I eventually figured out that I needed to upgrade the version of PHP installed in my GoDaddy hosting from 5.2 to 5.4 (and eventually I went to 5.6 as it was needed by 'Appointment Booking Scheduler' by Weblizar that I'll use for my online client booking tool). I now seem to have all the tools installed to create the website content I have (vaguely) in mind - so the next stage is to sketch out my sitemap and page layouts and to actually write my page content, pick some suitable (free) stock photos to use etc. I could waste tons of time fiddling around with this stuff (I already wasted time browsing through free stock photos to pick a suitable background image for my page 'header' background), so I'll have to be quite disciplined about working towards a website that is 'fit for purpose' rather than trying to make it an award-winning masterpiece. I did a couple of days of 'induction training' in December (had to fly from Sydney to Perth for the training, as the AFSL company does their training there) and managed to get 'registered' with ASIC as a Financial Planner before 1 Jan 2019. Looking back over my records, I'd been enrolled in the DFP course on and off for about six years, so it was only the pending FASEA rule changes that prompted me to hurry up and finish off the DFP to I could get registered before the new work experience requirements came into effect. Having completed the DFP I'm now enrolled in the ADFP ('Advanced' Diploma) with IIT, and I'm also doing a Master of Financial Planning (via distance education) through Western Sydney University. I aim to get the ADFP completed during 2019, while also setting up my business website, creating a marketing 'funnel' to prospect for potential clients, and (hopefully) starting to provide advice to some clients. I should be able to complete the Masters degree sometime in 2021. I might then do a MRes degree with the idea of eventually doing a PhD in financial planning at WSU (that should be a *lot* easier to complete part-time than the PhD I tried to do in astrophysics). Fortunately the AFSL company I've signed on with provides considerable resources for their 'authorised representatives' in the form of documentation templates, feedback on strategies being considered for clients, and has a requirement for all SoA (Statements of Advice) to be prepared by a professional third party paraplanner service. They also 'vet' all SoAs produced by new planners, so there is considerable supervision and assistance provided. On the down side their monthly fee is over $1000 (plus they also retain 20% of all revenues until annual income reaches a certain threshold), and there is also a minimum monthly fee for the required CRM software. Then for each SoA there will be paraplanner and vetting fees of around $250. The fees charged by the AFSL company cover such things as PI (Professional Indemnity) insurance, annual compliance costs (monitoring CPD requirements are met and conducting an annual audit) and the processing client fees and commissions. My initial plan is to slowly build up to servicing around one new client per month, by which point I should just about 'break even'. Fortunately I'll be running this business in the evenings and weekends, while still keeping my full-time 'day job', so there isn't any great need to become profitable in the short term. Initially my business losses will have to be 'carried forward' until eventually I'll be able to deduct them against my other (salary) income (once my assessable income as a sole trader reaches $20,000 pa). Aside from all the usual 'business expenses', I will also need to keep track of how much time I spend working on my business in my 'home office'. I won't use the dedicated office area I've setup in my home for meeting with clients (I plan on meeting with clients in their homes), so I won't be able to claim a deduction for pro-rata 'occupancy expenses' such as rates, house insurance and so forth, but I will be able to claim a deduction (at the set rate of $0.45/hr) for 'running expenses'. I also had to register for GST, so I've started using Reckon One (online accounting) to track things and help prepare my annual BAS statements. As I'm now registered for GST I'll also have to include any UberEats delivery income in my BAS returns. Another negative month, with my geared share portfolio and retirement savings balances each dropping by more than $20K, while our house price estimate stabilized. Still waiting (and hoping) that the global stock market 'correction' is over, but it appears that there may be further weakness ahead. The Australian economy is still growing quite well, so there may soon be a buying opportunity. Our Superannuation is already fully invested in growth, but my gearing is currently very low, so I could use my available margin loan facilities to invest in the local stock market when it seems to have reached the 'bottom'. 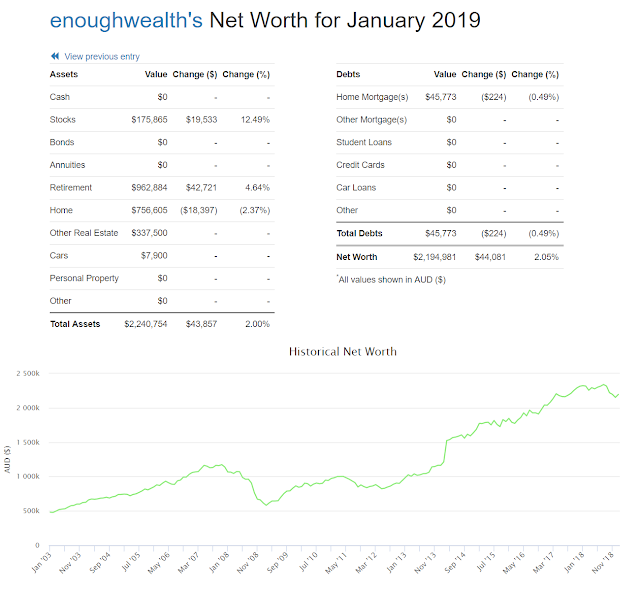 However, as I am currently funding around $1,200 per month for my Financial Planning registration fees (without any clients so far) from my wage cash flow, I don't really want to add margin loan interest payments at this stage. - complete the four courses for the Master of Financial Planning degree I've enrolled in for 2019 (1 per quarter).